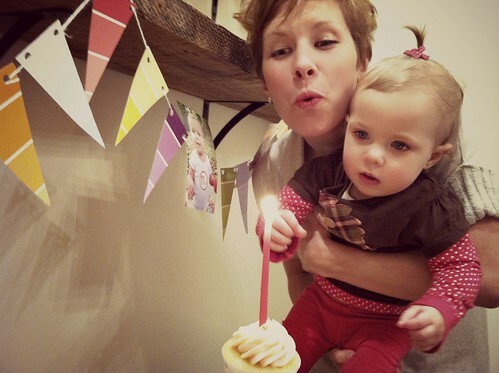 We celebrated Nora’s first birthday over Thanksgiving weekend, but since I ran my Creative & Clutter-Free Gift Ideas series last week, her party pictures and update had to wait until this week! The party was a success — and while we just invited Dave and my immediate families (14 adults and 3 kids), I was still pretty impressed that I planned the whole thing — including food, decorations, and Nora’s gifts — for less than $50! 1. I used simple (and free) decorations. While I love the look of fancy decorations — that’s just not my style. 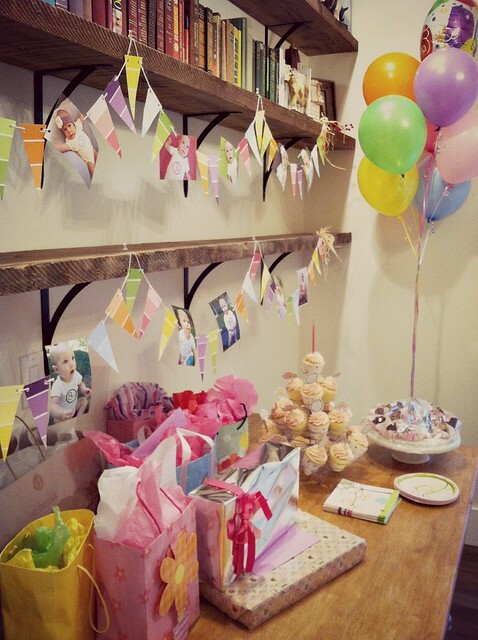 I like the idea of doing lots of decorating, but I’m too practical to spend any amount of time or money decorating for a 1 year old’s two-hour birthday party that she’ll never remember! 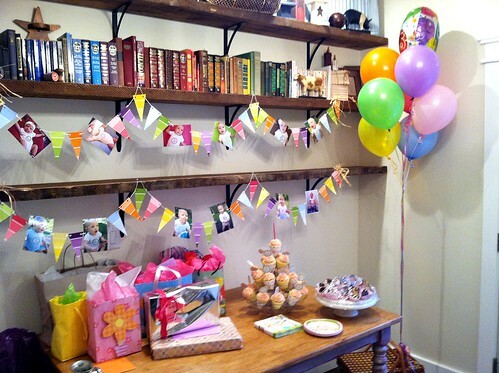 Instead, I used her monthly pictures along with colorful paint swatches (from a local hardware store) to create a playful bunting by the dessert and gifts table. 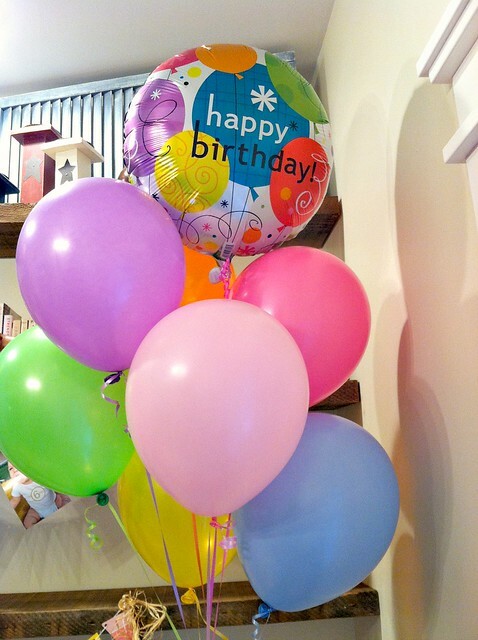 I also picked up some helium balloons at the dollar store for a little extra color. 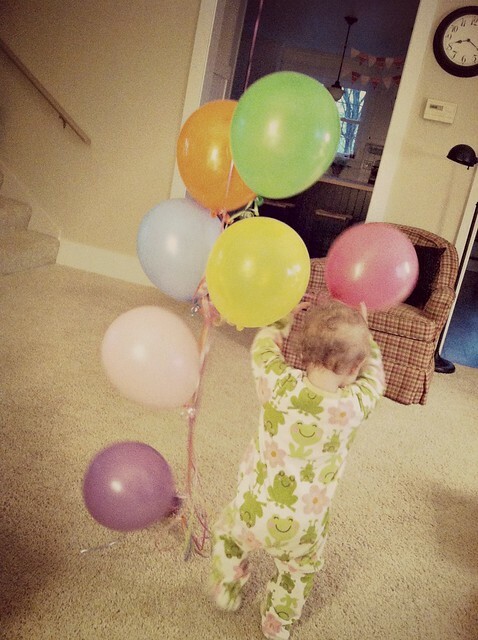 Of course, the balloons were Nora’s favorite part of the whole night! The balloons were also the first “toy” she wanted to play with the next morning! One other thing I did was to create a “memory collage board” right by the front door. 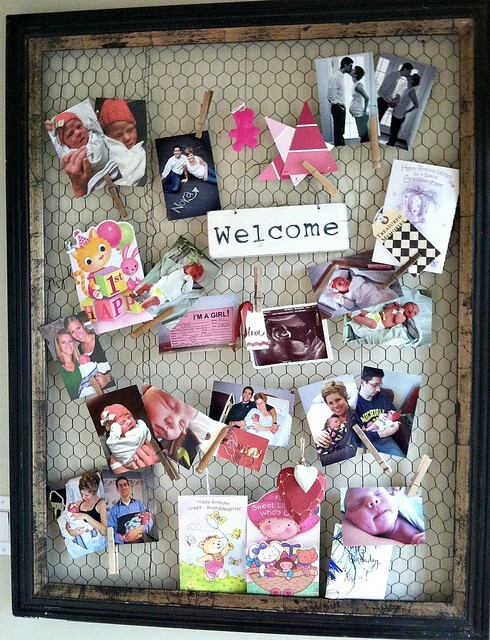 I already had this chicken wire board hung by the front door (I use it to display our Christmas cards) so I simply swapped out the Christmas cards for Nora’s birth photos and some memorabilia from last year at this time. 2. I made simple foods. 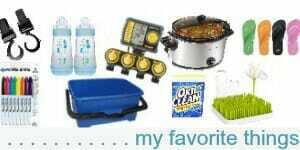 Pop, Lemonade, Water, Milk, etc. I assembled the sandwiches and cut up the veggies earlier in the day, and put the fruit salad into single-serving cups so guests could easily grab one cup and keep moving. All I had to do was put the sandwiches in the oven and set everything out on our kitchen island when it was time to eat. 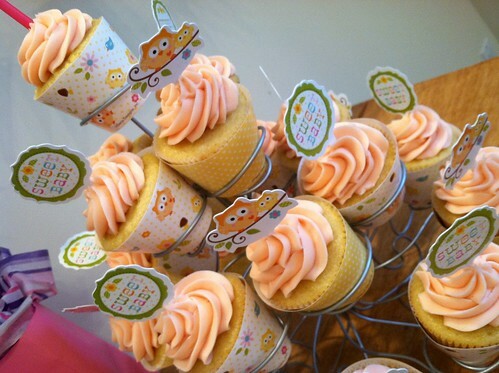 A big thanks to my lovely friend Megan (owner of Morning Glory Sweets and baker extraordinaire) who graciously donated the cupcakes for Nora’s party — helping me stay well below my $50 budget! Don’t they look fabulous? 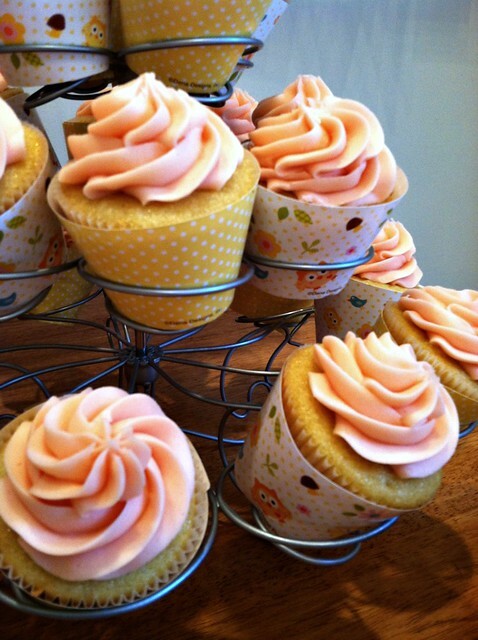 Well, I can guarantee they taste even better than they look! Dave and I were just a little excited to have a few cupcakes left over at the end of the night! 3. We gave simple gifts. 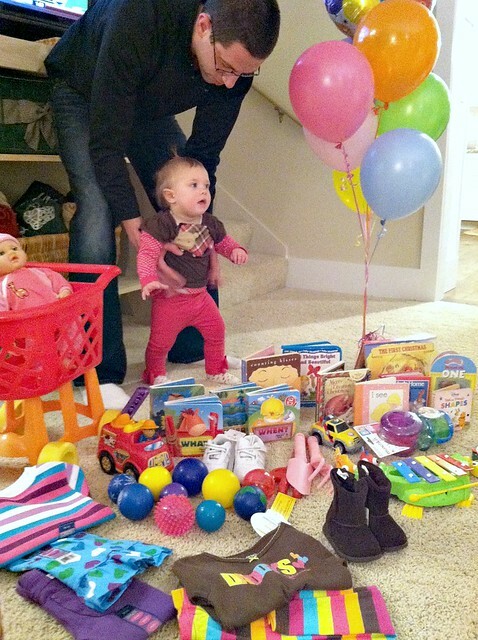 Nora is not going to remember this party or the gifts she received. She certainly doesn’t need anything — however, as her parents, we can’t throw her a party without getting her at least one small gift! 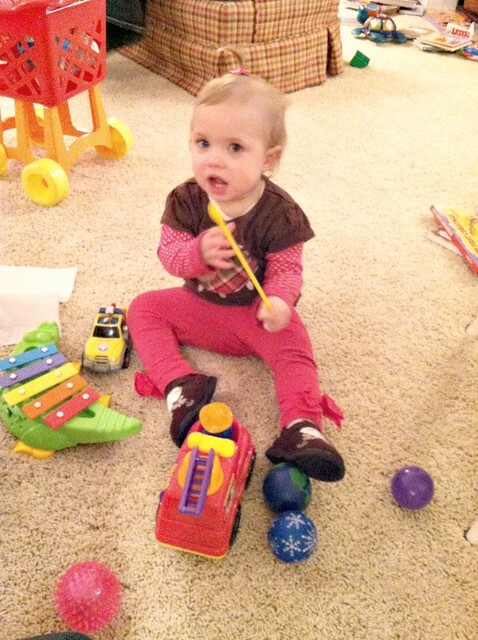 Thankfully, I was able to use my Huggies rewards points to get her a fun Alligator Xylophone for free — and she absolutely LOVES it! 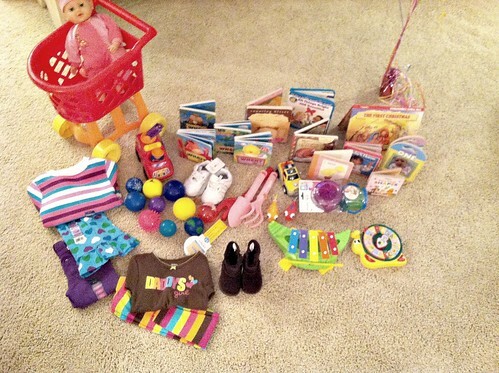 Of course, her aunts, uncles, cousins, and grandparents spoiled her with lots and lots of other fabulous gifts! 4. I skipped invitations, party favors, & activities. Since we just invited immediate family members, we simply called or emailed with the party details… eliminating the need for invitations. I also skipped the party favors as I often feel like they are just needless clutter. And besides playing with Nora’s new toys, singing Happy Birthday, and blowing out her candles, there were no planned activities. 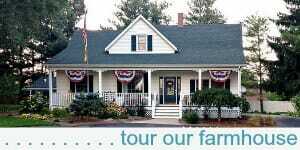 I figured we would be fine chatting and playing for a few hours without any planned itinerary that might also add additional cost (and prep work). Overall, the party was a grand success… and even if Nora won’t remember it, Dave and I will! I’m sure Nora’s party pales in comparison to many first birthday parties, but it worked for us, and I’m thrilled that we were able to pull it off on such a small budget! So the only money I actually spent was the $7.49 I used to buy balloons — not bad for looking relatively cute and feeding 14 adults! Do you have any other tips for party planning on a budget? 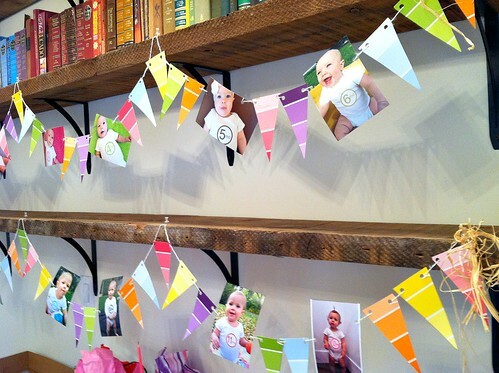 Those are the kinds of birthday parties i grew up with 🙂 those are the best in my opinion 🙂 i do love the paint sample flags, such a neat idea for any occasion! 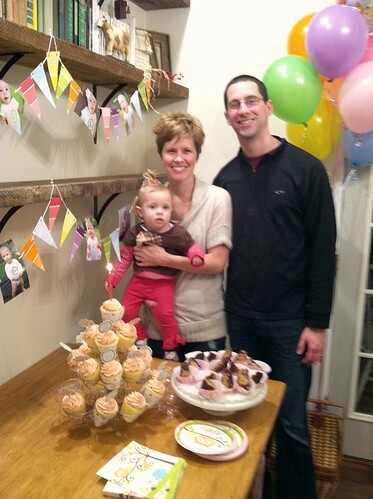 You are so inspiring as you show us how you provided an inexpensive, yet precious first birthday party for Nora. Some very silly (in my opinion) spending goes on in this luxurious American culture that is not necessary. Plus, the volume of presents for children often times becomes ridiculous. I so appreciate your approach to life! I love love love the bunting! We are always doing projects around our house, so I have a ton of these – what a great way to use them up! 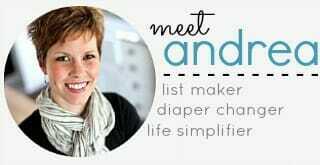 Andrea, how was your experience ordering a ‘rewards’ gift from Huggies and Pampers. I have been saving points as well and am nervous to ‘cash in’ my rewards. Did you get what you wanted? Was the process easy? How long did it take to ship your item(s)? Thanks for your feedback. SO refreshing. Classic and just right. Awesome job. Nice party. I always wonder what the paint stores think about using their paint chips for things like this so I’m always chicken to go in there and take them. Any thoughts? Oh, and you are smart to start like this. It’s hard to go backwards once they remember from year to year. I speak from experience! Love how classic and simle you kept it! We know so many people who go way above and beyond what a 1 year olds party should be and I was starting to feel bad for my boys. With our youngest son soon to be one on Dec 16th I just cant see spending a small fortune on his party. I feel so much more excited to get creative now that I read this post…and stay on budget! Thank you! HAPPY BIRTHDAY NORA! Sounds like a just-right, fun birthday party! I LOVE to see people celebrate good times, with family or friends, and not be overly-extravagant. Nora looks well-loved. You are doing an amazing job of raising Nora to focus on the important things in life, her loved ones, rather than the materialistic things in life. IMHO children’s birthday parties have gotten way too extravagant with each year trying to top the previous one and families to top each other. Where does it end? Bravo to you and your family! That’s my kind of party! Looks like it was a lot of fun!! I love it! So cute and very creative. I love the paint swatch banner, I am going to use that for my husband’s 50th party in July! Thanks for the idea!! 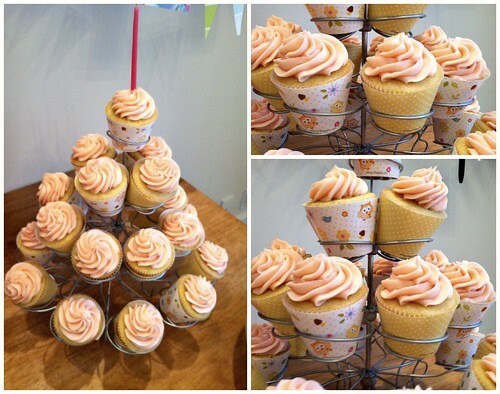 I may even use your menu….fuss free and simple- I love it!